The recycle bin is one place on our systems, that gets filled easily. When we delete files on our PCs, we create another storage problem if we don’t empty our Recycle Bin regularly or just permanently delete files instead. The Bin is the temporary home to all deleted files of the PC. Deleting files to the bin sometimes causes storage space issue on our PCs, because these files also take memory space, so until we decide to delete them permanently they are still sucking memory on our hard drive. 1) Open Task Scheduler by using the command “taskschd.msc” in the Run windows. 2) Then click on “Create Basic Task” option. 3) Input Name & Description in the field provided and click the next button where you would set the time interval for the task. 4) After that click on the Next button again here in this window you can set the interval for when the trigger will be fired. Select how frequent you want the Recycle bin to be emptied and click on the “Next” button. 5) Click on the next button and fill up “cmd.exe” in the Program/Script field. 6) Save all those settings and then select up the task you just created and run it to check whether it works or not. This would flash up the CMD windows on your screen and then clear up your Recycle Bin. 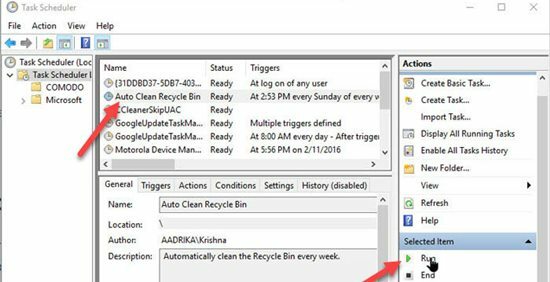 7) Now the Recycle bin would be cleared automatically according to the trigger you set in the Task Scheduler. 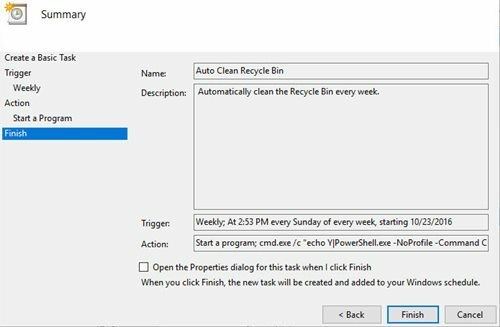 After doing this, you wouldn’t need to clear your Recycle bin yourself. Be sure not to keep important files in the bin cause when it time as set in the trigger it would delete it automatically.